If you read German, this title is a must have! The history of the Second World War continues to occupy historians and the interested wider public alike. Historiography has provided us with insights into the war, societies and virtually all other areas that have a point of contact with this conflict. German historiography in particular has undergone a number of changes in the approach to and views on this greatest conflict of modern times. Roughly speaking, the first twenty years after the war were characterised by memoirs of former generals and the thesis that Hitler had abused the German people and the German armed forces. From the late 1960s onwards, a generation of younger historians questioned this approach. Not only had they not been directly involved in the Nazi regime, but the opening of archives and the return of captured documents to Germany enabled this generation to look into new aspects and to provide new insights into the period. In line with the 1960s social changes and the advent of Marxist views in western German historiography, it was now argued that German society was far more important and involved in the Nazi regime than claimed hitherto. The same development can be seen in the historiography of the German armed forces in that period. Today it is obvious that the pendulum swung from one extreme to the other: Initially, all responsibility for genocide, war crimes and the like were denied by the former generals and the wider public. It was deemed appropriate to blame Hitler himself, his clique of Nazi leaders and the Waffen SS for all the atrocities committed between 1933 and 1945. With the advent of the new generation and their different approach to history this changed: the Wehrmacht was now regarded as an instrument that spread terror, committed war crimes and was an active supporter of Nazi ideology. A low point in this development was reached with the first Wehrmacht Exhibition that opened in 1995. The crude arguments and the simplistic views presented in this exhibition called for a more balanced and less biased view and also awoke a new and wide interest in the history of the Wehrmacht. As a consequence, the prestigious Institut für Zeitgeschichte launched a research project which looked at the Wehrmacht and the role of the armed forces during the war. The aim was not so much to provide narrowly defined studies on operational or traditional military history, but to explore the role of the organisation Wehrmacht for and in the Third Reich. Another aim was to explore the social history of the Wehrmacht. In total, the project produced five monographs by Johannes Hürter, Peter Lieb, Dieter Pohl, Andreas Toppe and Christian Hartmann. The emphasis of the publication was on the war against the Soviet Union. Moreover, the members of the working group produced over 50 articles, some of which were published in the work that is part of this review and which marked the end of the project. Christian Hartmann’s monograph explores the realities of war in the first year of the German-Russo war, the division between front-line and hinterland and the involvement of the Wehrmacht in war crimes and atrocities. His aim is not to understand the Wehrmacht as an institution and its role per se, but to provide us with an understanding of the 10 million German soldiers who were deployed to the Eastern Front. He concentrates his work on three fields that he regards – correctly – as the core areas of the Wehrmacht in the Second World War. Thus, his study is occupied with the biggest service of the Wehrmacht, the army, and its struggle on the decisive front of the war, the Eastern Front. Hartmann restricts his study to the first year of the war in the East, in which, as he puts it, »everything was decided, not only the war against the USSR«. Moreover, he claims that an evaluation of this period offers the best insight into the aims and ideas of the soldiers involved in this struggle, since the Wehrmacht was convinced of its strength and full of self-confidence, so that the actions of individuals and bigger social groups were not driven by outer influences, but from within. Within these three parameters, Hartmann examines the actions and histories of five German divisions. Divisions have not played a prominent role in modern military history, but Hartmann is right in arguing that the division was vital in the military organisation and that an examination of the divisional level offers many new insights: the structure of a division and its strength (the divisions examined were between 9,000 and 18,000 soldiers strong) put it in a place between two fields that have attracted most attention in military history; tactical studies and the fate of the individual, low-ranking soldier on the hand, and high-ranking generals and their operational and strategic decisions on the other hand. By choosing divisions as his study’s units, Hartmann closes this gap, because divisions operated at the interface between tactics and the operational level of war. He chooses five divisions that provide a representative view of the entire German army in the East in 1941/42: One tank division, two infantry divisions, and one Sicherungsdivision that was deployed in the hinterland away from the front-line and fulfilled a double-role as both fighting and occupation unit. 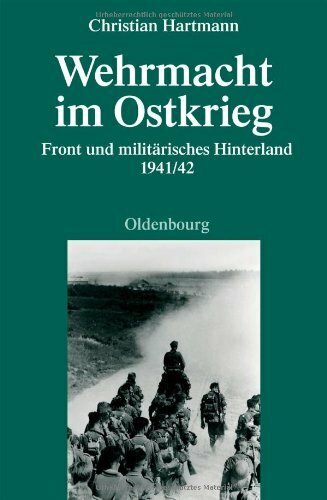 Last, but not least, Hartmann examines the role of oneKommandant/Kommandantur des rückwärtigen Heeresgebietes or Korück(Commander of the hinterland), an example of the occupation forces that were deployed closer to the front-line. Even though not a division in the traditional sense of the word, Hartmann argues that a Korück’s size and structure made it comparable to such a unit. This is the foundation on which Hartmann bases his evaluation. In five main chapters he then analyses the formations and their experiences in the first year of the war. The first chapter deals with the structure of the divisions and their composition, showing the differences in the individual units. In the second chapter Hartmann turns to the soldiers of these units. He analyses the social structure of the units; the soldiers’ backgrounds and their decorations and casualties as indicators for their bravery and combat effectiveness. Chapter three is devoted to the experiences of the individual units from June 1941 to June 1942. Hartmann clearly shows the different experiences of the units and their approaches to challenges such as regular and partisan warfare. These factors are picked up and developed in depth in the last two chapters in which Hartmann analyses the differences between front and hinterland and examines the contribution of the different units to war crimes and atrocities. Units of all five divisions were involved in war crimes in the first year of the war in the East, but Hartmann’s research enables us to differentiate: Maltreatment of prisoner and mass executions did not occur constantly, but were restricted to certain times and influenced by outer parameters. The worst behaviour in the sample group was shown by troops deployed in the hinterland, and, perhaps more surprisingly, by the elite 4th Panzer Division. Hartmann explains this with the social structure of the divisions: The 4th Panzer Division was commanded by a general who initially showed strong sympathies for Nazism and the region from which the division recruited was characterised by a strong general support for the Nazi regime. Moreover, the division between front and hinterland was of great importance. This is perhaps less surprising, but Hartmann shows this in a new clarity. The units at the front concentrated on their military core business – fighting, killing and getting killed. Occupational policy was the business of the troops of the hinterland. Even though this division of labour was sometimes broken down by deploying rear-echelon troops to the front and increased partisan activity in the hinterland, this division remained intact throughout the period examined. It was the regime’s aim to concentrate the army in the front area and to relieve it of as many tasks in the hinterland as possible. In 1943, 2.65 million German soldiers were deployed within seventy kilometres from the front-line while only approximately 200.000 were deployed further to the west as occupation forces. As a consequence, wide areas in the rear could no longer be controlled by the Wehrmacht. Hartmann’s findings are striking and shed a new light onto many areas of the debate concerning the Wehrmacht and its role in the war in the East. He shows that the degree to which units were involved in war crimes was dependent on the role they had to fulfil in the Wehrmacht and occupational structure and was also influenced by rather random factors such as the area of deployment and time. Hartmann does not negate the fact that the Wehrmacht as an organisation was guilty of war crimes in many areas, but he argues for a more balanced and differentiated approach with regard to single units and individual soldiers. With his book »Wehrmacht im Ostkrieg«, Christian Hartmann has presented an outstanding work of scholarship. It is a prime example of German historical scholarship at its best. The structure of the book and the arguments are clear and compelling and they are supported by a vast amount of references. Also, the book is a »good read«, something that cannot be said of every academic book. Historians that have been educated in the English-speaking world might find the sheer amount of footnotes and the density of references a little daunting. It is up to the reader to decide if they want to see this as a weak point of the book. It should be clear that a scholarly work that can only be criticised for being academic is a great achievement. And Hartmann’s book is one of these works. In contrast to Hartmann’s monograph, the last volume of the project published by the Institut für Zeitgeschichte contains a selection of articles by some of its members that also deal with the war on the Eastern front. In the introduction, the authors point out that an official view of the institute does not exist with regards to the war, German atrocities, etc. and this becomes obvious in the contributions of the authors, the approaches they have chosen and their conclusions. In total, the book contains ten articles by five authors. The first article by Christian Hartmann »Verbrecherischer Krieg. Verbrecherische Wehrmacht« picks up the themes discussed in his monograph reviewed above. Again, Hartmann points out the organisational structure of the German occupation of the Soviet Union which concentrated its forces near the front-line, and, as a consequence, resulted in the »dominance of military topics« for the Wehrmacht units, because they had to concentrate on their main task: fighting the Red Army. He then sums up the findings from his monograph with regards to prisoners of war, holocaust and partisans. The article provides a good – and much shorter – alternative to his monograph. The second article by Dieter Pohl »Die deutsche Militärbesetzung und die Eskalation der Gewalt in der Sowjetunion« examines the role of the rear echelon troops and the occupation forces in the hinterland; that area that according to Hartmann was only insufficiently controlled by the Wehrmacht owing to both the weakness of the forces in that region and the fact that other organisations and party branches were often put in charge. Pohl concludes that the role of the Wehrmacht cannot always be analysed to the last degree, mainly because of problems with the availability of sources. Nevertheless, his findings put the Wehrmacht on the whole in a more negative light than Hartmann’s elaborations. Pohl argues that the military leadership accepted a »programme for murder«, which was implemented with the attack on the Soviet Union, but which saw a general radicalisation from September/October 1941 onwards, when it became clear that operation Barbarossa had failed. Another change is identified by Pohl for the months November/December 1941, when it was obvious that the war in the East would turn into a prolonged conflict, and that it would be important to utilise prisoners of war and the non-Russian population for the German war effort. However, the killings of Jews and other groups continued so that the spiral of escalation was not fully stopped. A further dimension of escalation was then introduced in 1942/43 with the increase in partisan activity and the German counter-measures that led to harsh reprisals and a massive loss of live. On the whole, Pohl argues that the increasing level of violence in the rear areas was not the sole responsibility of the Wehrmacht, but that a high level of anticommunism and racism in the armed forces contributed to this radicalisation. In contrast to the two aforementioned articles which examine the Wehrmacht on the whole, Johannes Hürter chooses a case study. »Die Wehrmacht vor Leningrad« deals with the war-fighting and occupation policy of the German 18thArmy in the Leningrad region in the autumn and winter of 1941/42. Hürter shows that the decision to besiege Leningrad and to starve the population to death rather than to occupy the city came as a surprise to the troops who had prepared themselves for an attack on the city. Interestingly, this decision set in motion a radicalisation of the army’s occupation policy in its rear areas: if the death of a city had been decided by the higher leadership why should the soldiers worry about the fate of a few hundred thousand civilians in the hinterland? »Necessities of war« were now brought forward as the reason for a barbarisation of warfare, but Hürter shows that this term was used in a loose fashion and that the situation of the German troops in the Leningrad area was difficult, but not so desperate that the measures taken against the civilian population could be explained by military necessities. Hürter argues that, owing to the amorphous structure of the German state and also the German armed forces, the army level (between corps and army group) was the decisive level with regards to the barbarisation of warfare. At army level the directives from the higher leadership were turned into actions. In some areas, this worked in favour of the civilian population, because the armies tried to ease the fate of the population. Sadly, in the area of 18th Army under Generaloberst Küchler, it did not. A second article by Dieter Pohl concentrates on the mass murder of one particular group, the Jews in the Ukraine between 1941 and 1943. His findings further differentiate our understanding of the »war of extermination« in the East. From July 1941 to July 1942, Pohl argues, different phases of an extermination policy in all stages of escalation occurred in this region. Pohl offers an interesting view on the German approach: In contrast to widespread belief, it was not the aim of the German occupation forces to exterminate the local population, but the killing of real or alleged enemies was seen as a tool for the destruction of the Soviet Union. It was this aim that was shared between the Nazi regime and wide parts of the Wehrmacht and which resulted in the comparatively small resistance from the Wehrmacht to this barbarisation. The prime target of this policy was the Jewish population that was widely seen as the main bearer of Bolshevism. Within the Wehrmacht Pohl makes out different opinions and views. The higher up the chain of command the issue of harsh measures was discussed, the more support could be found for it. He also sheds light on the co-operation between the military, the civilian authorities and the SS and police. While difficulties existed and the opinions of individuals sometimes differed from the official view, Pohl concludes that all organisations contributed willingly to the extermination of the Jews in the Reichskommissariat Ukraine. While the first half of the book is devoted to the bigger picture, the second half deals predominately with individual impressions and experiences from the war in the East. The first article is Johannes Hürter’s »Es herrschen Sitten und Gebräuche genauso wie im 30-jährigen Krieg«. Hürter has worked in depth on biographies of German generals and this article follows the approach taken in his monograph »Hitler’s Heerführer«. The article offers a view on the first year of the war through documents of General Gotthard Heinrici, first a commander of an army corps and then commander of an army in the middle sector of the Eastern front. Hürter introduces the person Heinrici, his background and his life up to 1941. He then presents a wide range of personal documents, from diary entries to letters to his wife and his family. The changes in the occupation policy are reflected in Heinrici’s observations, for instance the shock of the invasion’s failure in 1941 and the realisation that the Soviet population had to be utilised for the German war effort, an approach that he encouraged in his area of responsibility particularly in the years 1942 to 1943. Nevertheless, for him Russia remained a »foreign, and backward culture like one from the middle ages…«. He experienced the deterioration of warfare and the increasing number of atrocities which appalled him. He tried to stop the policy of scorched earth during the German retreats, but finally he had to realise that »the trade of soldiering is no longer satisfying«. Peter Lieb’s article »Täter aus Überzeugung« also concentrates on an individual officer and his experiences. He examines the role of Oberst Carl von Andrian, commanding officer of Infantry Regiment 747, one of the regiments of 707thInfantry Division. This division is of special interest, since it was used by the organisers of the Wehrmacht exhibition to show the ongoing brutalisation of the war in the East. The division, mainly used for operations behind the front-line, has a particularly bad reputation, because it was involved in mass executions to a high degree. Lieb provides an overview of the complex role of his article’s antagonist. On the one hand, Andrian supported the harsh measures taken by the authorities and excused them as necessary steps in order to pacify the country. On the other hand, Lieb shows that Andrian suffered from this situation and that he often complained about the brutal behaviour of German troops. The article makes clear once again that the question of brutalisation of warfare in the East was multi-facetted and that this development cannot be explained one-dimensionally. Christian Hartmann’s article »Massensterben oder Massenvernichtung« sheds light on the fate of Soviet prisoners of war. Similar to the articles by Lieb and Hürter, he uses autobiographical sources (in this case a personal diary) to explore the realities Soviet soldiers were facing in German prisoner of war camps. The author of the diary was a re-activated national-conservative Major named Gutschmidt, from 1940 to 1944 commanding officer of several prisoner of war camps, from 1941 onwards on the Eastern front. Hartmann first gives a short account of Gutschmidt and his life, before exploring the German prisoner of war camp system on the Eastern front of which Gutschmidt was an integral part. The article shows the flexibility that Gutschmidt, who was »free of hatred« towards the enemy, had in organising his camp, but also the limitations of that freedom imposed on him by his superiors and reality, for instance the vast number of Soviet prisoners that were captured by the Germans and the resulting food shortage. Moreover, bad and cold weather took its toll of the weakened Soviet prisoners. The combination of these factors resulted in horrendous losses even in camps with sympathetic personnel like Gutschmidt. The last article in this group of personal accounts comes again from Johannes Hürter who examines the reports from Werner Otto von Hentig, the representative of the German foreign office at the 11th Army headquarters. Hentig reported his experiences of the fighting on the Crimea in 1941/42 back to his superiors in Berlin. This article nicely complements the other contributions, since it concentrates on a civilian representative and his views on the war in the East. Accordingly, the emphasis of Hentig’s report was less on pure military matters, but rather on questions of policy, the treatment of the civilian population and prisoners of war. He heavily criticised the German approach which did not only result in horrendous civilian casualties, but also in an alienation of the indigenous population. The reports can therefore be seen as a rather drastic example of criticism of the German approach to the war in the East. At the same time, they are also a document of the powerlessness of traditional diplomacy in this gigantic struggle. Throughout the war, the foreign ministry was not able to influence German policy in the occupied territories. It was decided either by military necessities or – to a higher degree – by Nazi ideology. Obviously, there was no room here for traditional diplomacy. The final article in the book is a rather short contribution (8 pages) dealing with an alleged order from Stalin dated from 17 November 1941 which stated that Soviet troops had to attack villages in the German hinterland. Not only would this weaken the Germans, but it would also alienate the population, because the alleged order stated that the Soviet troops should wear German uniforms. In their contribution Christian Hartmann and Jürgen Zarusky show that the version of the order stating that German uniforms had to be worn by Soviet troops was not part of the original order and that the order had been re-produced incorrectly for political reasons. Overall, the final major work of the project of the Institut für Zeitgeschichte on the Wehrmacht in the Second World War offers a wide range of different views on the German-Soviet War. All articles, although differing in their general message, are well researched and presented in a convincing scholarly manner. It is highly recommended not only to historians, but also to the general reader, because it provides a good overview of the Wehrmacht and answers questions regarding the occupation policy on the Eastern Front – in particular for the years 1941 and 1942.